Surrounded by vineyards, volcanic mountains, and thermal spa resorts, Lake Balaton is a stunning body of water in western Hungary that attracts sun seekers, foodies, music lovers, and watersports fans from neighboring countries to Central Europe's largest lake. Though largely unknown outside the region, it's a great year-round destination to pair with visit to Budapest, just an hour's drive away. But it's especially appealing in the summer, when you can cool off from the Hungarian heat at one of the many lakeside resorts that dot the shoreline. Lake Balaton is almost 50 miles long and 10 miles wide at its widest point. It's a freshwater lake, but it's a striking milky green color because of the algae that grows in the shallow waters. Around the lake you can roam the north shore's rolling hills, climb an extinct volcano in the Tapolca Basin, pick your own plants in Tihany's lavender fields and spot wild boar, lynx and stag in the Balaton Uplands National Park. For the best views, head to the Badacsony Hill on the north side of the lake. Known as the Hungarian Sea, Lake Balaton attracts landlocked sunseekers from across the country. The average water temperature in the summer months is around 25 degrees centigrade (77 degrees farenheit), and the safe shallow waters make it a great destination for families. Many of the lakeside resorts along the shoreline cater to children with artificial sandy beaches, playgrounds, sports pitches and paddle boats. The north side of the lake is home to established resorts like Balatonfüred and Balatonalmádi, where you can relax on grassy banks by the water, while the south side has more of a party vibe with a lively club scene in resort towns like Siófok and expansive artificial sandy beaches in Fonyód and Balatonlelle. In winter, the surface of the lake can freeze over and when it's thick enough you can go ice skating and even ice sailing. Lake Balaton's prestigious Blue Ribbon (Kékszalag) sailing competition attracts huge crowds every summer. It's Europe's longest round-the-lake sailing event and sees competitors navigate a 93-mile route in the fastest time possible within a 48-hour period. 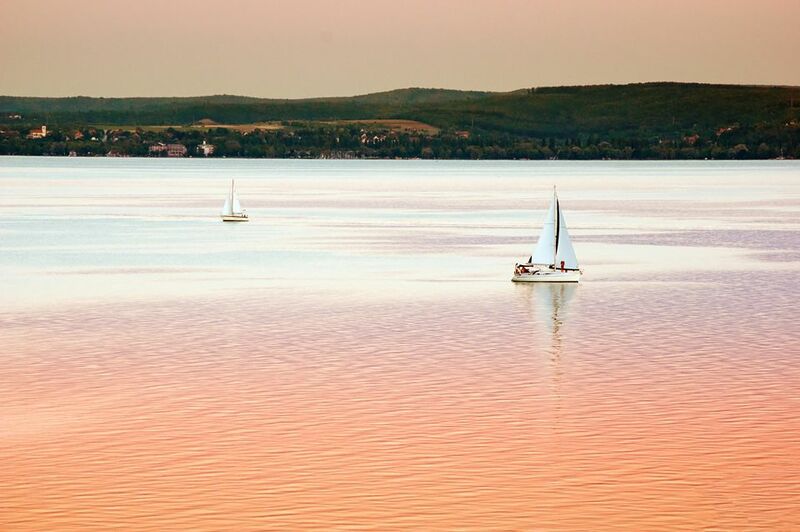 To explore the lake at a more leisurely pace, consider renting a boat or chartering a yacht with a skipper from one of the large marinas in Balatonfüred, Siófok or on the Tihany Peninsula. No motorized sports are allowed on the lake, which makes windsurfing and kitesurfing all the more enjoyable. For an even gentler ride on the lake, kick back on the deck of one of the passenger ferries that sail between Tihany and Szántód. Founded by the team behind Budapest's legendary Sziget Festival, Balaton Sound is one of Europe's biggest open-air electronic music festivals. The five-day event takes place in Zamárdi on the lake's southern shore and the site features floating bars, food trucks, a camping area and chill out zones dotted with hammocks and bean bags. You can swim and sunbathe by day and dance to big-name DJs at night. Previous acts include Tiësto and David Guetta. The north side of the lake is a prime wine-growing region, particularly around Badacsony, where the fertile soil contains volcanic rock and is rich in minerals. Cisterian monks planted Badacsony's first vines in the 14th century and the Pinot Gris grapes that grow in the area are still referred to as Szürkebarát (grey monk). Many of the hillside vineyards offer cellar tours and tastings. Highlights include Laposa Birtok, which features a large terrace overlooking the lake; and Homola, a family-run winery in Paloznak that offers tastings paired with snacks and live music events. Time a trip in August to enjoy the Balatonfüred Wine Weeks, an event that showcases around 250 different types of wine from the region. On the northern shore near the town of Keszhely, Heviz is Europe's largest thermal lake. The healing sulphuric waters are naturally heated to around 30°C (86°F) and are said to help promote relaxation and ease ailments like rheumatism. You can spend your time floating in the waters around the historic bathing house or book a soothing massage. There's also a hospital in the area for treatments based around water therapy. Foodies flock from far and wide to Kistücsök on the south shore of the lake. Considered one of Hungary's best restaurants, it serves fine dining dishes in a laid-back setting. Locally sourced, seasonal ingredients feature heavily on the menu in dishes like pickled cucumber soup and pork belly with green bean stew. Budapest's popular Bock Bisztró has an outpost in Vonyarcvashegy and serves Hungarian-style tapas dishes alongside excellent local wines. Craving some gourmet beach food? Order artisanal burgers, pizza, and sandwiches at Kishableány, a hipster spot in a converted 1960s building in Badacsony. For spectaular views of the lake and a menu full of traditional dishes and wines from the Balatonfüred-Csopak region, Ferenc Pince Csárda on the Tihany Peninsula is hard to beat. You can explore Lake Balaton on two wheels without encountering any road traffic. A wide path encircles the entire lake along a route that encompasses 93 miles of coastline. There are rental shops in the major resorts and plenty of pit stops along the way to pick up drinks, ice cream, and traditional Hungarian beach food like fried fish and lángos (a flat savory donut topped with sour cream). If you're looking for an easier ride, head to the south side of the lake, where the bike paths are flatter. The northeast corner of the lake is just an hour's drive from Budapest, and it's best to rent a car if you're looking to explore several towns in one trip. Otherwise, you can take a train from Déli Station in Buda or Keleti Station in Pest to resorts like Balatonfüred, Badacsony and Siófok, which gets you there at a slower pace: between two and four hours. You can also catch a bus from Népliget Station, but with frequent stops along the route, that can be a time-consuming trip. Once you're in the area, frequent local buses run between towns on the lake. There's a whole other world to explore beneath Lake Balaton. In the little town of Tapolca, adventurous travelers can boat through the eerie bluish waters of interlocking lake caves under the town's houses and shops. To embark on a boat trip through the caves, pay a small fee at the Tapolca Lake Cave Visitor Centre, where you can learn more about caves in 10 special installations. Attractions include a Bat Room, a Dripstone Room, a Cave Divers’ Room, and a Climbing Wall.